…there’s a large, unbuilt project that should be euthanized before it breathes. Fuqua Development paid some $35 million for the 28-acre University of Colorado Hospital site at Ninth Avenue and Colorado Boulevard. Though the location is top-notch, costs of demolition and infrastructure are substantial — perhaps not justifying the developer’s land cost. The project is gridlocked at the intersection of greed and desperation. Don’t ask taxpayers to rescue a bad deal with public subsidy. Alternatively, if the location is indeed “top notch” another option is to use citizen concerns as leverage for improving the overall plan. A limited survey of Hale neighbors revealed that 51% of 41 respondents want to proceed with site development even though they have serious misgivings about Walmart’s presence. A Congress Park survey disclosed that 42% of 245 respondents would not oppose a Walmart “if it were a more upscale or urban store,” which I think is what we’re talking about. The 245 respondents represent less than 3% of the over-age 18 population of Congress Park. A Mayfair neighbors survey indicates that over 90% of respondents either “oppose” or “strongly oppose” a Walmart, but I could find no accounting of the total number of people responding nor results for the question asking if the respondent would oppose a Walmart if it were an “upscale, urban store.” Jeff Fuqua is on record as wanting a “vibrant, high quality, mixed-use project” and as looking forward to “working with neighborhood groups, citizens and city officials on this important development.” In another interview he promises a place that will look more like the [upscale] Belmar development in Lakewood than Denver’s [rather more downscale] Stapleton neighborhood.” Fuqua has said enough at the public meetings that I’ve attended over the past year to indicate that he has an interest in finding common ground with residents. And while he’s obviously interested in making money I’m not sure I sense the “greed and desperation” asserted by Barnes-Gelt. 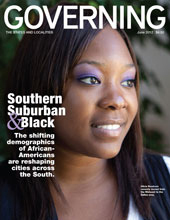 … after having saturated the rural and suburban markets, Walmart needs the cities. The company plays hardball, and city leaders should do the same. Don’t offer tax incentives. Don’t compromise on urban design…Monitor the treatment of workers and be prepared to respond to abuses. Aggressive enforcement of wage and hours laws, along with a “living wage” ordinance, can level the playing field for other businesses in the city and militate against the Walmart effect. 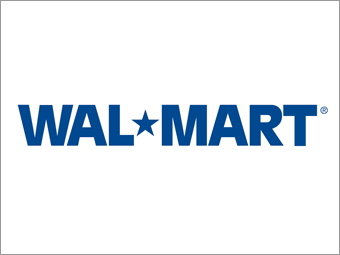 And finally, it’s worth noting that Walmart stores are unionized in every country outside of North America. The company adapts to local circumstances. I hope that residents and those interested in development at Ninth Avenue and Colorado Boulevard will avoid knee-jerk reactions to the name Walmart, and wait to consider the proposal on its merits and as part of the whole package. Walmart, like McDonald’s, has shown the ability to adapt to local needs, as in Aspen, where an unobtrusive McDonald’s provides a much-needed low-priced eating alternative. Not everyone in Aspen is a Saudi prince or a Hollywood star, and not everyone in the Ninth and Colorado area can afford to shop at Neiman Marcus and Whole Foods. House the Big Box retailer in a Signature Building: Something that (a) breaks from the “Neo-Modern” or what Belmar dubs the “American Mercantile” style that characterizes way too many of these developments and (b) respects the medical history of the site. Some particular forms are suggested here. These would better meet the Design Guidelines’ call for “notable architecture” that creates “a unique character” for the site (pages 34-35). The building should be capable of accommodating other possible uses if the market decides that a Walmart doesn’t work in this area. 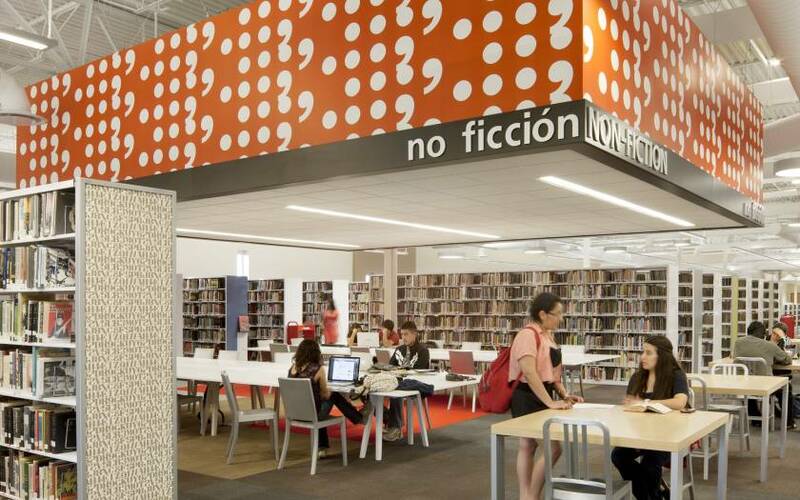 An abandoned Walmart in McAllen, Texas, for example, was transformed into a wonderful public library. Install a pedestrian walkway and bikeway over Colorado Boulevard at 9th Avenue that connects the site to Congress Park: As suggested here, this would be good for kids and other living things interested in accessing the site from the west. This feature would also go a long way toward meeting the project’s “Core Urban Design Values” (as expressed on pages 2-3 of the Design Guidelines) of providing “a rich and varied network of vehicle and pedestrian routes into and through the Site that connect to surrounding local streets and bicycle routes,” and creating “a walkable, pedestrian-friendly environment that invites repeat visits from near and far.” The Design Guidelines would appear to allow the flexibility to install such a feature. Save and develop the 1965 Research Bridge over 9th Avenue: The General Development Plan identified this feature as “a strong iconic element that…provides a singular reminder” of the former Health Sciences Center. The original developer Shea Properties intended to preserve this historical feature and turn it into rental housing. Sembler opted for demolition. Is Fuqua willing to reconsider? As suggested here, the form of the hospital and its iconic bridge suggest a commitment to “green” building before it became fashionable. In keeping with an urban health and sustainability theme–and as a way to further reinforce the Design Guidelines’ call to create a “unique identity” for the site (pages 13 and 56)–why not rescue this element of the Shea plan and turn the bridge into affordable housing? The currently planned housing all qualifies as “luxury.” Shea intended 10% of the housing in its plan to be affordable. Of course, if just hearing the word Walmart is enough to get some local neighbors fretting about the “kind of person” who shops there there’s no telling what the combination of Walmart and “affordable housing” might do. These suggestions are fully consistent with the themes of Blueprint Denver, especially where they meet that plan’s recommendations for historic preservation/adaptive reuse of existing buildings, multi-modal (i.e., pedestrian and bicycle-friendly) streets, and affordable housing. They are consistent with the goals of Denver Comprehensive Plan 2000, especially where they address that plan’s call for “expanded housing options for Denver’s changing population” and “enhanced opportunities for people in need to work and participate fully in community life.” It seems to me that the physical features described above can easily co-exist with a Walmart in constituting a “Town Center” (page 43 of the Blueprint Denver plan), and that Walmart itself could be instrumental in helping to achieve the goals of both plans. I’m sure the neighborhood associations are filled with people capable of imagining other adjustments and concessions that could be sought as a quid pro quo for working with Walmart. It will be interesting to see if neighbors offer up anything other than “hell no” at the next meeting of Colorado Boulevard Healthcare District Board that’s scheduled for Thursday, August 2 at 4:00 in the Molly Blank Center of National Jewish Hospital.